The Mother of backyard productions (Janine) reached a new pinnacle of fame… For a whole ten minutes! “A Sara Mahoney contacted me on Skype asking ‘are you THE J9 ?’ Well yeah, my nickname at work is J9…….as in Ja nine. So yeah, I guess I could be THE J9. I can’t remember a Sara Mahoney at work but there’s been plenty of Sarahs come and go, and my memory isn’t all it was. So, I added her to my Skype. A while later she Skype phones me. I didn’t answer because I was in the middle of internet banking and didn’t want all my millions to be Skyped to her! When I finished checking my bank balance, and realised that I don’t have millions anyway, I saw that she was still on line. ‘who are you?’ ‘Helsinki. Please can you phone me?’ she says. ‘I can’t phone, the volume on my computer is playing up’ ‘I understand’ ‘Remind me which Sarah are you are’ ‘Mahoney’ ‘Can’t remember the surname, did I work with you?’ ‘Are you not dancer Janine? As in J9?’ ‘No I’m not a dancer 🙂 ‘ ‘Woops, sorry…wrong Janine Russell’ she says, and promptly hangs up! I get to thinking, “so who is this ‘Janine Russell from J9’ person that she thought I was?” And being as I was rushed off my feet with a million things to do before I go on holiday…. I thought I would spend an hour or two googling her. Did you enjoy that as much as I did? Can anyone top The Mummy’s brush with fame? Acapella song combining the dialogue of Star Wars with the the scores of John Williams (i.e. not just Star Wars, but E.T., Jaws, Jurassic Park, Indiana Jones etc.). The song was originally written and recorded by a vocal group called Moosebutter, and this lip sync video made by Corey Vidal has been very popular recently. Please check out their website, with many more clever fun acapella tracks. At the moment, there’s a great Harry Potter one on their homepage, to the tune of Pretty Woman! If you want to listen to more of their stuff, you can on their site (they say radio quality, but it’s pretty good), or support them by buying them in CD quality. There is also a page with all the lyrics too, so if you want to learn a song and lip-sync your own YouTube video :p you can. Seriously, they’re very good. Great harmonies and clever lyrics. I’d like to see a video of them performing the track! As some of you may know, I have an interest in singing, recording and mixing vocals / music. I’ve always enjoyed singing, from being in the choir at school, to good old karaoke nights down the pub, but recording wise, I’m just starting out over the past couple of years. Now I have a place of my own again, I’m keen to set up a little home studio (very basic!) and resume recording. I thought I’d share a track with you that I worked on in collaboration with an old housemate, Edward Clark. He’s a budding music maker, with a number of great tracks online. You can find his work / album / latest updates at The Calico Sequence website, and also on MySpace. We worked together on this particular track, the vocals were taken from a cover recording I made a couple of years ago, which were remixed with Edward’s backing, which I think gives the track a great contemporary feel. If you’ve already heard it, please accept my apologies – I hope to have more tracks soon! Please bear in mind that I am not a professional vocalist. I sing because I enjoy it, not because I hope to make a career out of it! Having said that, I do aspire to improve both the vocals and the recording production. Constructive comments welcomed!! In setting up this ‘blog’, we intended for it to be a small corner of the website where the members of Backyard Productions would have the opportunity to present some of their more personal opinions, events, news and work that does not fall under the auspices of ‘official’ Backyard Productions business. It is meant to enrich the BYP site, providing a broader range of more dynamic content for our visitors and encouraging wider community participation. We hope you enjoy seeing a more diverse side to the people that make up the company! Our eventual goal is that more BYP members will post here regularly. Please bear in mind that the opinions posted here do not necessarily represent the official ‘position’ of Backyard Productions. The Ulitmate Budget filmmaking book! I was at the Institute of Videographer’s (IOV) annual convention last week (Oct 16) and apart from drooling all over the great new camcorders, jibs, cranes, dollies and editing kit, I did take a look at the books section. I found a real gem called “Shut up and Shoot” by Anthiny Q Artis. It looked good, with some nice pictures eay words and big (making the £17.99 price tag a bit more attractive). It wasn’t until I got home however, when I realised just how VERY GOOD it is. It was as if I had written it myself (perhaps I should have!). It details how to innovative in budget filmmaking. 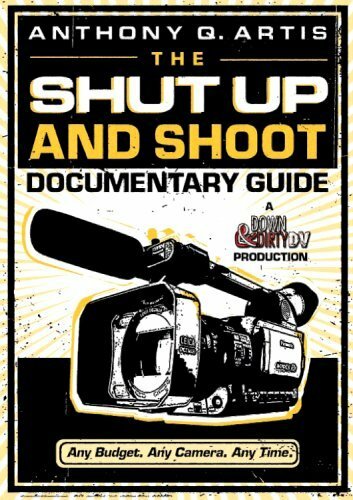 Some of the tricks I knew, many I did not and even as an expericed budget filmmaker, I found it a really good read! Better still, there is also a website with great up to date links for aspiring filmmakers. If you get the chance, you MUST buy this book, it explains in one place what my other numerous filmmaking books only try to achieve. Thier website is www.downanddirtydv.com Check it out! YOU CAN GET IT ON AMAZON HERE. Genius footage from Sesame Street which predates ‘Star Wars IV – A New Hope.’ You can hear why he got to play the voice of Darth Vader, despite his relative youth at the time (well… he was thirty eight). He was the first well known celebrity to appear on Sesame Street in 1969 (the pilot episode) and went on to appear in several others. He apparently recorded another alphabet for Sesame Street after his Star Wars role.